Novak Djokovic is one of the best tennis players in the world. Sports fans admire his brilliant professional skills: the young man demonstrates the universal style and combines calmness, prudence, and the aggressive manner of playing. The man has won 13 Grand Slam tournaments in singles. Throughout his career, he has become the top player in the world four times. In 2012, TIME included him in the top 100 most influential people list. The future tennis star was born on May 22, 1987, in Belgrade, the territory of former Yugoslavia. Novak mentioned he owed his success to his parents: the mother Dijana and the father Srđan supported their elder son in his sports endeavor. Novak was the first person in the family who devoted himself to tennis. The father, who was a professional pilot, succeeded in soccer. When the boy turned four, he took a tennis racket for the first time. 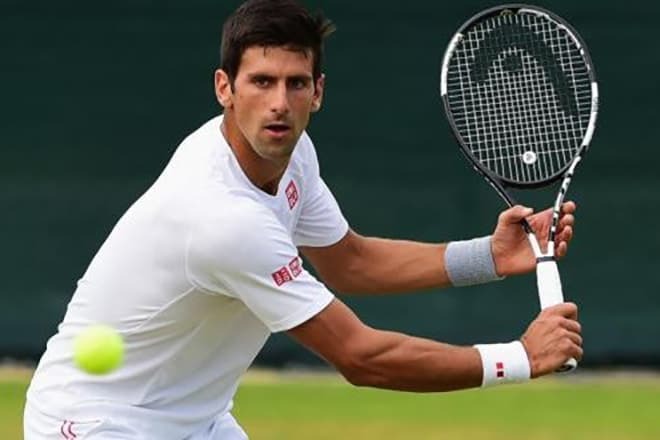 At six, the Serbian tennis player Jelena Genčić noticed his abilities and told the parents Novak was the most talented child she had ever seen. Thus, Dijana and Srđan cared about the son’s sports career. Genčić trained the would-be sports star until 1999 and spent much time teaching him the tennis basics. In his interviews, Novak said his first coach was like a second mother to him. When the boy was eleven, NATO planes began to bombard Belgrade. Novak celebrated his 12th birthday in a bomb shelter. Djokovic told CBS journalists he tried to remember that times with no hard feelings, even though everything was chaotic. As children did not have to go to school, he had more time for tennis. Still, the war cost the boy 76 nights that he spent in an underground shelter, terrified, without getting a wink of sleep. Jelena Genčić tried to keep teaching Djokovic even at that challenging period. She was a notable figure in the Serbian tennis and could easily get permission to play at any court; the woman was looking for secure places. Each night, a new object was being bombed. As long as some territory was “bombed out,” it was safe for training. After Genčić, the former Croatian tennis player Nikola Pilić worked with Novak. In September 1999, the 12-year-old boy moved to the Pilić tennis academy in Germany and studied there for four years. In 2001, the 14-year-old athlete debuted in the professional sports. Teenage Djokovic made the impressive start: he won the European Junior Championships titles. Besides, he was the member of the team “Junior Davis Cup” that went to the finals in 2001. 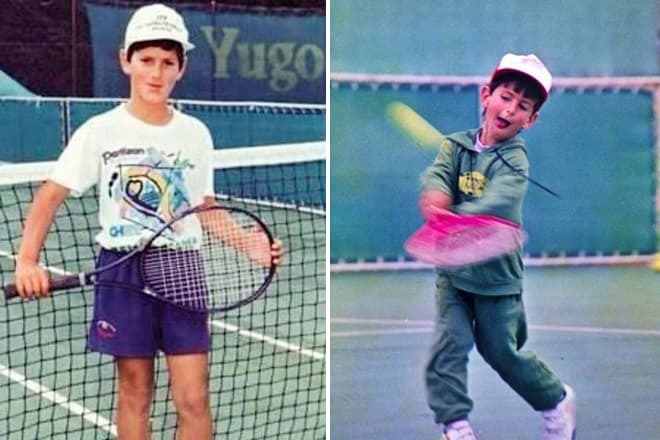 Novak has two younger brothers, Marko and Djordje who also took an interest in tennis early. However, they have not been as successful as their elder brother. It is challenging to count all the titles and prizes the athlete has won. He won 13 Grand Slam tournaments; the first victory took place in 2008 when the Serbian player defeated the three-time champion Roger Federer in a semi-final match. By 2018, Novak Djokovic is the five-time ATP World Tour winner; he gained this title four times in a row – it is the recording accomplishment. Tennis lovers emphasize Novak’s style: he is a universal athlete who can play equally good on any court (grass, clay, carpet, hard). Due to his excellent movements, Djokovic can serve accurately and powerfully. The sportsman’s backhand (the hand turns back to the ball) is notable for its high speed and extreme precision: many experts believe it is one of the best serves in the world. Thanks to his dexterity, Novak is a difficult opponent. Still, he has his weaknesses as a player: sometimes, the young man lacks stamina to take the last step to the victory. If a match lasts long enough, Novak feels exhausted, and his attention wavers. 2015 became the year of success: the Serbian player won the Australian Open and defeated Roger Federer in the Wimbledon final game. Besides, Djokovic won the US Open and reached the finals of all Grand Slam tournaments. The same year, Forbes put the sportsman on the second position in the list of the highly-paid tennis players; only the Swiss athlete Roger Federer surpassed him. Overall, Novak won $63 million (the prize money), and his ad and partner agreement earnings were $31 million. In addition to his sports qualities, the man stands out for his sense of humor. Novak Djokovic is fond of imitating his colleagues which often makes the audience burst with laughter; for instance, he can parody Maria Sharapova and Rafael Nadal. The sportsman’s fans believe his nickname “Joker” derives from his cheerful disposition and simultaneously contains the phonetic allusion to his second name. Djokovic is a man of intelligence. He calls himself the fan of languages: Novak is fluent in his native Serbian, English, Italian, German, and French. Apart from tennis, the young man is fond of soccer and supports Italian, Serbian, and Portugal clubs. 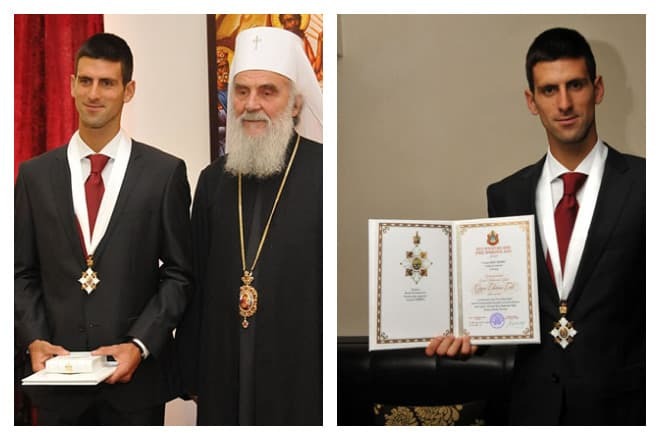 Djokovic is an Orthodox Church follower; he financially supports old cathedrals renovation and received the Order of St. Sava, 1st class. The athlete is an enthusiastic philanthropist. Since 2007, he has his own fund helping Serbian children and refugees from other countries. In 2014, there was a flood in Serbia. At that time, Novak won a tennis competition in Italy and donated the prize money, $750 000, to help those affected by the disaster. In 2006, Novak Djokovic started dating Jelena Ristic; according to the athlete, she is the love of his life and the source of his inspiration. In 2014, the couple married, and their son Stefan was born in a while. In 2014, Internet rumors had it Novak and Jelena split up. Nevertheless, the tennis player regularly posts happy photos of himself and his wife on his official Instagram page: apparently, their relationship is good. At the beginning of September 2017, Djokovic’s second child, the daughter Tara, was born. Novak participates in business projects. In 2005, his family founded the company Family Sport which later opened the café chain “Novak Café” in Serbia. In 2016, Novak and Jelena opened the health food restaurant “Eqvita Restaurant” in Monaco. Besides, Djokovic created the book Serve to Win: The 14-Day Gluten-Free Plan for Physical and Mental Excellence where she described his diet, healthy food, and some facts about his life. In January 2018, Djokovic lost to the Korean athlete Chung Hyeon in the Australian Open; fans could hardly expect the sportsman would lose in all three sets. It was the arm injury that manifested itself: in June 2017, it had prevented Djokovic from finishing the season. At that time, people worried if the tennis player would end his career. Anyway, Djokovic’s results at the ATP in Rome were good: he defeated Albert Ramos and Kei Nishikori and reached the semi-final. Still, he could not beat Nadal. Thus, Rafael Nadal and Alexander Zverev took part in the final. In London, Djokovic improved his results and played against Marin Čilić in the final, even though he lost to the Croatian athlete. In June 2018, Djokovic won his fourth Wimbledon victory. He outplayed Rafael Nadal in the semi-final and faced Kevin Anderson in the final. This achievement took Novak Djokovic back to the top ATP players.